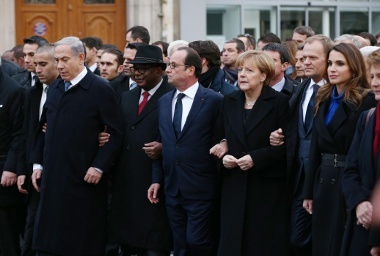 The world leaders — including President François Hollande of France, Chancellor Angela Merkel of Germany, Prime Minister Benjamin Netanyahu of Israel, President Mahmoud Abbas of the Palestinian Authority and Prime Minister David Cameron of Britain — joined the march in a solemn line. 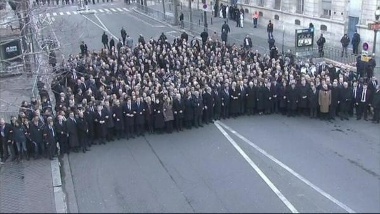 They moved slowly, clasping arms to show solidarity with the victims. The crowd roared in approval. At various times, those in attendance burst into spontaneous applause and occasionally into “La Marseillaise,” the national anthem. The NYT description is completely fake. 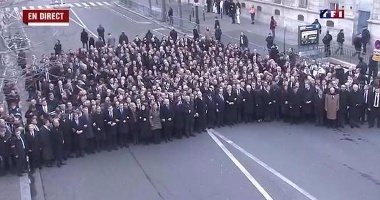 As you can see below the crowd never had a chance to even see the “world leaders”. They never joined the march. There was no crowd at the photo op to roar approval. 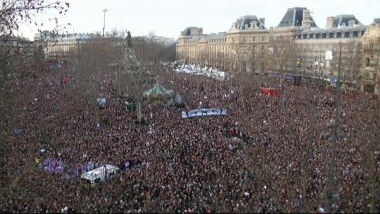 Many people marched in Paris to express solidarity with those killed in attacks there last week. As often happens in big marches, a small, violent minority hijacked the event for their own twisted ends. 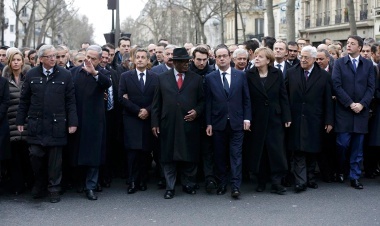 Even criminals who were allegedly uninvited, like Netanyahoo, took part in the photo-op. Actually the fake “front row” of the march was rearranged, with the Palestinian dictator Abbas suddenly missing, to fit Natanyahoo’s election campaign needs. Here is one picture of the front row of hypocrisy with Abbas next to the German chancellor Merkel (and Sarkozy next to Netanyahoo). Abbas was removed, (as was Sarkozy), and the queen of Jordan was put in his place. But that was still not good enough for Netanyaahoo to use in his election campaign and its tweets so some unknown second row person was put next to Merkel in a shot for Netanyahoo to use. This event truly brought everyone in the world together. In revulsion at these politicians abusing it to polish their image.